The Real Techniques make up brushes have been created by Samantha Chapman; a London based make-up artist who has a very successful Youtube channel featuring different videos on topics such as make-up tutorials to demo’s on how to use her brushes. In all honesty, I picked up these brushes before I even knew who Samantha Chapman was or what she does. I had heard great reviews, the prices were what I was willing to pay and hey, they look pretty damn cute and fun! I have had these brushes for over 12 months now and I can safely say that the Real Techniques products are one of my all time FAVOURITE brands of make-up brushes because of one huge factor; the amazing quality – and I now own almost every single brush in the entire range! 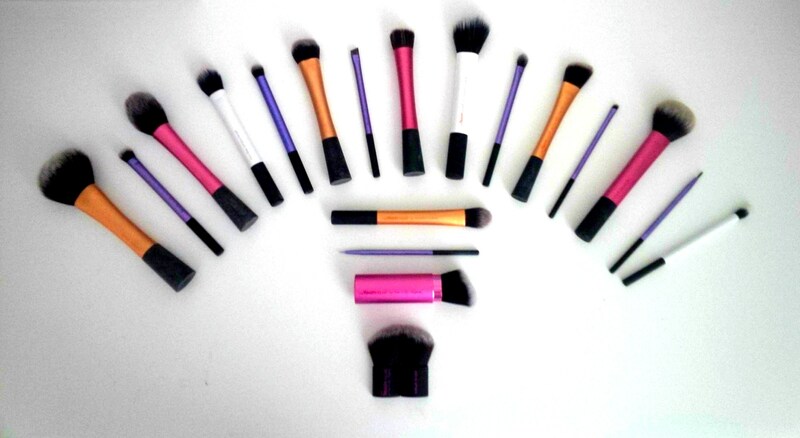 The face brushes are either pink or orange and the eye brushes are purple. Real techniques also features a special limited edition duo fibre brush range which are white. The larger Real Technique brushes can stand up on their own which gives you more options on how to store your brushes! The black base of the brush is made out of a very similar material to the Nars packaging so it can get dirty and can be difficult (almost impossible) to clean. The writing on my brushes has started to fade/come off but that doesn’t bother me at all. With a huge portion of my make-up brush collection – you can really see the toll it takes on the brushes in the cleaning process. With both spot and proper deep cleaning. The bristles start to thin and fall out, change in texture by starting to get stiff and rough and the handle starts to get worn. In my personal experience, this is not the case with my Real Techniques brushes (to date!). After you spot clean lower quality brushes, there is a bad smell that comes off of the bristles and this has never been the case with Real Techniques products. I love that these brushes are as thick and dense as they were when first purchased and that fall out is something that rarely happens. 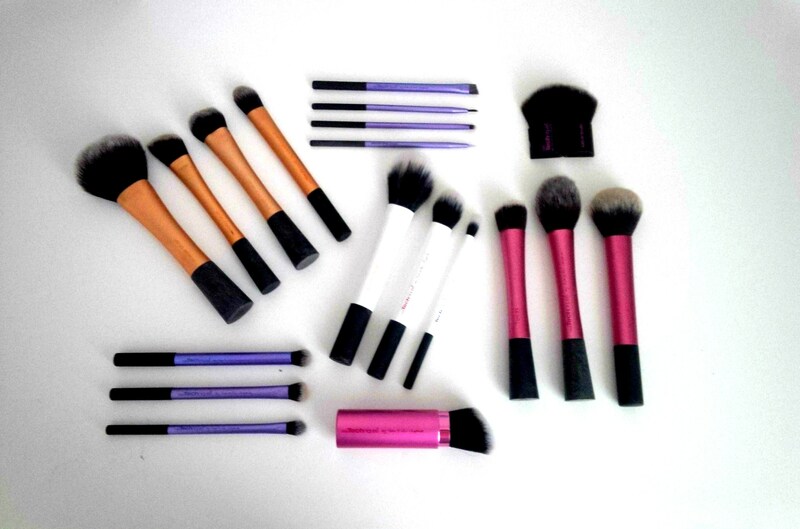 I do take care of my brushes (I have written a post on how!) which definitely shows with these products. The brushes pick up and deposit a good amount of product on your face without it getting stuck in the bristles which is a factor that I LOVE because I don’t like wasting product and if your brushes do this – you will not get much product on your face at all. And oh my gosh can we just talk about the price for a minute? These prices are absolutely fantastic! In Australia, you can purchase these brushes in-store from Priceline but I personally bought all of mine from a website called iherb. There is a significant price difference online and if you are a first time user of this website, you can get a discount code just for signing up! In my experience, after the order is finalized and you receive your ‘item is shipped’ e mail – it has never taken more than 7 days to receive my products. Overall, this is a brand and range I would definitely recommend. You do not have to be starting out in make-up to go for these products – they are great quality, something that you could definitely use in your every day routine and one of my personal favourites! Have you used these before? What do you think about them? What are your favourite brands of make-up brushes? Let me know your thoughts! :O Finally someone in Australia who discovered the beauty that is iHerb! Have you tried their Harvey & Son’s organic peppermint tea?? It is to DIE for. Also, thank so much for the lovely review! I usually stick to the more high-end brushes, but I’ve been looking for cheaper alternatives to bring on trips and such. Will definitely give these a go! I LOVE my RT Brushes! ❤ so affordable and great quality! OMG me too! 🙂 no problem!! Thank-you so much and also thank-you for taking the time to read this!! I have followed back 🙂 Your blog is amazing!! Always love to find another RT lover in the blogosphere! They’re so good – Nic’s Picks pack has been my highlight so far! They definitely are!! I just find them to be such great quality brushes AND affordable 🙂 thank-you so much for reading and commenting! !